You don't need to live at the coast to decorate your home with pictures of seashells. Many of us who are landlocked enjoy having pictures of sea life in our homes. When I lived close to the ocean in Florida I didn't appreciate my seashell collection as much as I do now. I live far inland in New England and the beaches just aren't the same up north. I still love the ocean and miss walking along the coastline in search of some unique treasures to bring back home. Now I can have other bits of home decor with pictures of seashells to remind me of my beloved Florida beaches. I do some photographing of my own shells, and those images can end up on products for the home. I've also been blogging about collecting shells, the mollusks inside them and have discovered some beautiful items of interest that feature these works of art found in nature. When I lived in Florida I used shells to decorate my gardens, hold items in the kitchen and bathroom, and as dirt cover in my potted plants. Now I use pictures of them to create more useful items anyone can use around the home or office. 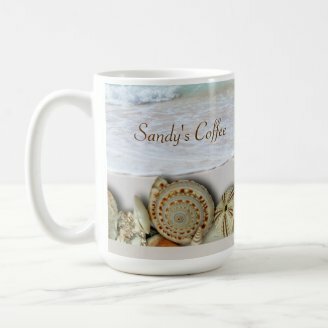 When I found Zazzle, my seashell photos were some of the first things I used create products and they began to sell quite well. Since then I have branched out to isolate some of the images and that gives me more creativity options. 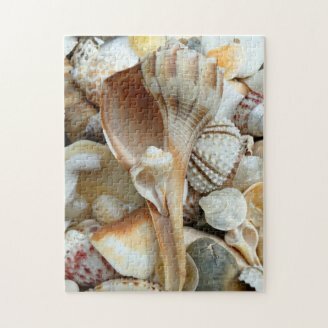 As more items become available at the Zazzle site, I continue to add my own personal seashell photography and designs to everything from mugs to puzzles, clocks, paper and more. 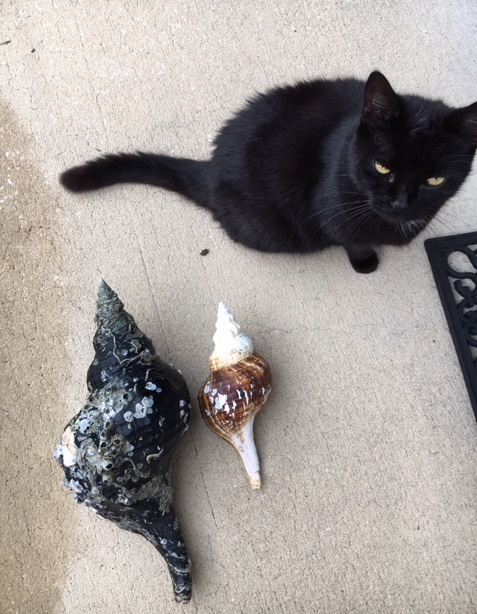 If Zazzle sells it, I will put shells on it! Perfect for a best friend or the hard to buy for boss. Many people enjoy a good cup of coffee in the morning and sometimes all day long. 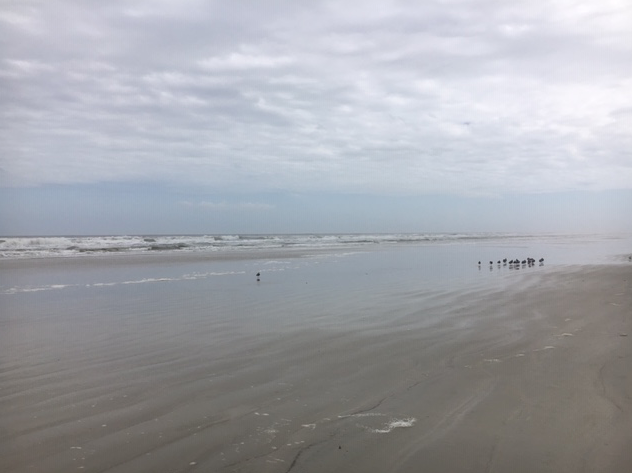 A lovely personalized coffee mug with realistic seashells and a background image of a pretty sandy beach and lapping ocean water would be much appreciated by the recipient. Mugs and cups of good quality, made personally for a friend or boss are fabulous gifts. The text on this mug can also be totally removed. Don't keep your seashell pictures hidden away in the bathroom! Knowing the recipient of the gift well will help the giver decide what to shop for. Some gifts would be appreciated by most everyone, and small items with low price tags can be used as stocking stuffers or party gifts. The woman who has a great kitchen and loves to cook might like some new dish towels, cutting board, personalized apron, serving dishes, or little rugs. I don't know why people tend to use seashell art and pictures in their bathrooms only, when the artwork and photography of these special sea creatures can add so much to a living room or any prominent area of the home. Kitchen aprons have come back into style and they are especially important to wear around the holidays when so much baking and cooking is being done. Crisp, white material has a clean and fresh look that anyone spending time in the kitchen would love. Pretty blue and orange Christmas tree ornaments surround a big, white starfish on the front of this white, bib apron. A single line of text beneath is easy to customize with a name or cute saying. Tropical themed aprons make a nice hostess gift too. Puzzles are a fun activity on vacation, especially when the weather is bad or the power is off! Puzzles may seem old fashioned these days and you'll seldom be able to get the kids to sit and help put one together, but the novelty of it may just hold their interest long enough to create a family memory. The trouble with doing puzzles is that they usually take a while to finish and in the meantime, they must be set up on a table which takes up valuable space. Therefore you may encounter a puzzle set up at the grandparent's home. Or you'll drag one out while on vacation and the weather has kept you inside. It's a great way to keep busy when the power goes out, even if it's more difficult to see by candlelight! 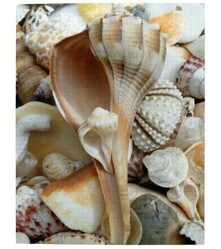 I've made some seashell puzzles using my own photography of the shells I collected when I lived in Florida. This one has the adult and juvenile "lighting whelk" in the forefront with lots of other pretty shells beneath. I think it would be a challenge to put together, but the finished product could be hung on the wall. A reader of my blog sent me this image of a big horse conch. For those who love the beach or want to be reminded of summer's warmth. 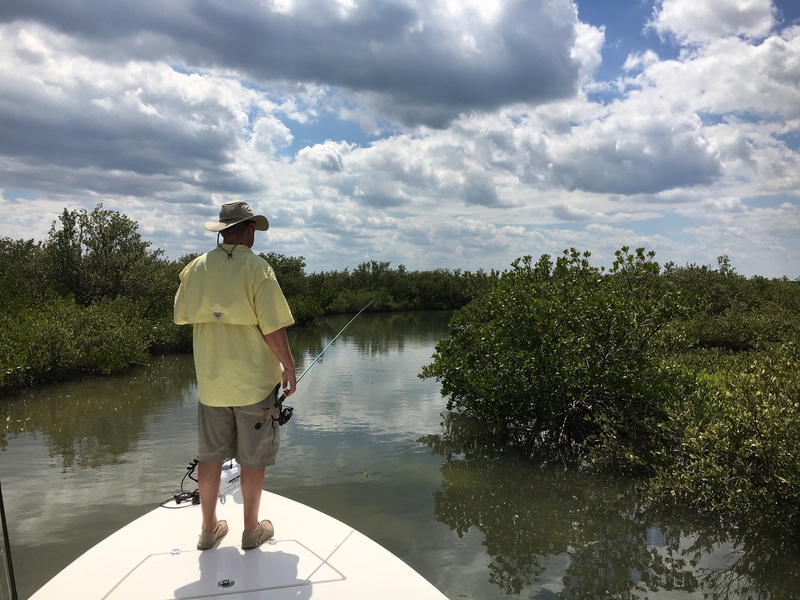 My blog about Florida and shell collecting there. Is your home decorated in a particular theme? I really like your seashell puzzles. They would be a lot of fun to work on. No, only very vaguely. The family room does have a few bombay items and one bath has a few seashells. We have many very small sea items coming home in suitcases. Empty seashells are fine to collect. It's the living ones that you need to leave at the ocean. Love the sea-shells, it reminds me of the sea and the beautiful beaches. I did collect some of these but left it there because I remembered reading somewhere that it affects the eco-system and the environment. I think you should play around with it and see what happens. I am not a professional photographer by any means, but it's fun to see what I come up with. None of my photos are taken at the sea since I now live far inland. I keep thinking of your seashell photography. I have some shells, too, but not enough to make a composition. It's a great idea to have these printed canvas. I keep thinking how to photograph them by the water. Problem is, the sea would drag them in. I might have to do two separate images, but I'm not sure I could get the effect right. Have fun Mira, sounds like a plan! Love the way you write and with all the zazzle products, it looks so beautiful to read.